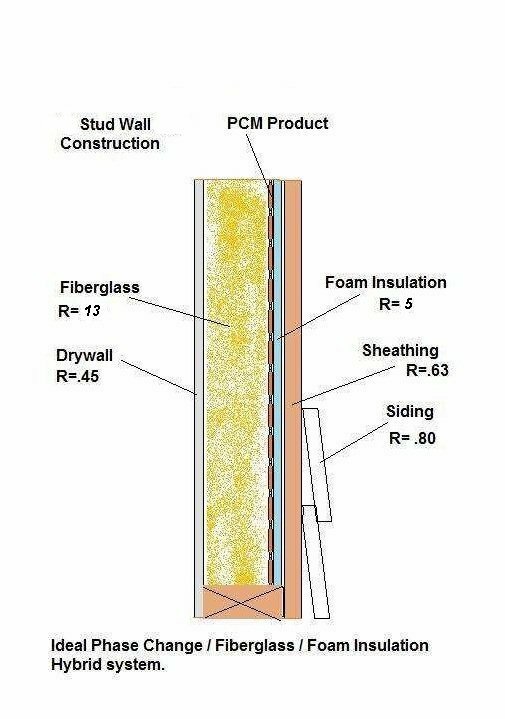 The best placement of the PCM layer is where the PCM is allowed to thermally communicate with the outside building surfaces more readily than the inside building surfaces. The way this arrangement works is that the PCM layer maintains a steady temperature close to the inside temperature, reducing the heating or cooling load on your HVAC units. This saves energy. Small heat flows because of smaller temperature differences between the PCM layer and the inside of the room winter or summer. The smaller the heat flow the less HVAC energy it takes to control it. By choosing a PCM that is slightly above the inside temperature, you facilitate freezing at night and melting during the day. There are two different approaches that use two different characteristics of PCM. One places the PCM layer near the inside of the room. One company even adds the PCM to the drywall. The fundamental benefit of placing the PCM on the inside is to absorb excess energy during the warm part of the day and release it back into the room during the cold part of the night. Some energy savings have been demonstrated with this method. The main problem with this method is that for any PCM to work it must go through a phase change. If the inside room temperature stays at the same temperature all of the time, the PCM will not change phase. This will not work unless you can control the inside temperature to “force” the inside temperatures to go above and below the phase change temperature of the particular PCM chosen. This means that you are limited to a narrow range of PCM to choose from and it must change phase near the desired room temperature. Generally the energy saving benefit is limited to load leveling effects because most of the stored, then released, energy originates from the HVAC units. If a PCM does not change phase (melt /freeze) it does not work. When PCM is placed into an attic space, ventilation can help facilitate “cool charging” the PCM at night in the summer months. In winter months it is best to close off the ventilation to allow the still attic air to be warmed by the solar load to provide “warm charging” the PCM from the solar heat energy. The PCM then releases this stored solar heat energy during the night time when it is needed most. All through the year the outside wall and roof surfaces that are exposed to sunlight get hotter during the day and colder during the night. (Cloudy, rainy days excepted) These surface temperature swings are much more extreme than the outside air temperatures and the solar load must be considered. The solar collector benefits are very valuable in the winter months. Both methods make the home more comfortable because they maintain more uniform inside temperatures. This can encourage adjusting the thermostat to a more energy saving setting. Insulation is needed between the PCM and the outside, however we must insure the phase change of the PCM is primarily controlled by the solar load and the PCM will remain at the phase change temperature during the 24 hour diurnal cycle. Thus the PCM should be sandwiched between two layers of insulation for maximum efficiency. 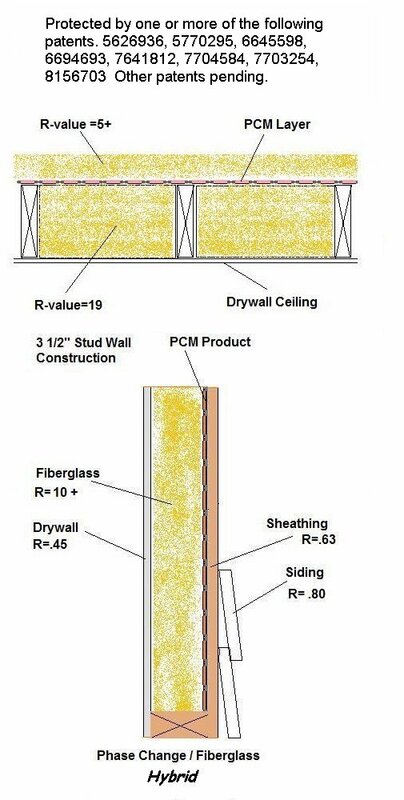 The outside insulation layer should have a lower R-value than the inside insulation layer. There are considerations that make suspended ceilings an exception, when you can program the HVAC settings, and the building is not occupied at night. In this case the PCM is placed just above the ceiling tiles. The HVAC is programed to charge the PCM layer at night . During the day the previously charged PCM layer helps lower the load on the HVAC system. This also makes the room temperatures more stable and comfortable. Schools and office buildings are two examples but this applies to any buildings that are not occupied at night.